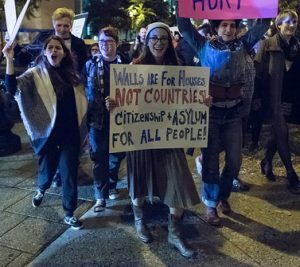 Chicago meeting: After the election: How do we oppose Trump’s fascism and move forward? After the election: How do we oppose Trump’s fascism and move forward? The election of Donald Trump, even with a minority of the vote, was a victory for U.S. and global counter-revolution. It is a serious setback for all freedom movements. What Trump represents is fascism, the brutal excrescence of capitalism under threat. He poses as a champion of white workers and middle-class people while offering them a vision of the past which pushes women, African Americans, immigrants and others “back in their place.” He offers no solution beyond scapegoating and hatred. How do we fight this backward movement? What are fascism’s roots in capitalism, racism, sexism, heterosexism and imperialism? Can economic classes be counterposed to “identity politics”? Can a vision of liberation help dispel the fake alternatives that the Right pushes? Can a philosophy of freedom help release the full power of the freedom movements for the needed reconstruction of society? Join us for a free and open discussion.